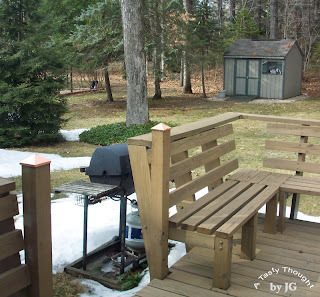 Looking out onto our deck four days ago only a small amount of snow was in sight! Woohoo! Glancing slightly to the left our much used grill sits... patiently waiting. I was thinking about grilling fish. Grilled Fish is so tasty and so easy to prepare. However, around dinner stepping outside with a winter coat to grill seems... well, frankly, it's uncomfortable. It's at these times that baking a fillet of fish in my warm kitchen is the thing to do! There will be plenty of time for grilling. When? I don't know, but I'm sure there will be! BTW Baked Haddock is delicious! So there's no need to step in snow to prep dinner. The method of baking Haddock is similar to grilling Haddock. However, 2 Bay Leaves are placed under the fillet in a baking dish. Line a shallow baking pan with foil. Spray with PAM. Place Bay Leaves on foil. Rinse fillet in cold running water. Place fillet on Bay Leaves in baking pan. Drizzle Olive Oil on fillet. Sprinkle small amount of Paprika on fish. Then, repeat with a small amount of Thyme. **Small amount = 2 shakes of the Paprika or of the Thyme. We enjoy Baked Haddock with a microwaved "baked" potato and a salad. 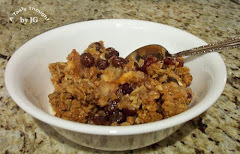 This is an easy and a very tasty dinner! Great for this time of year! 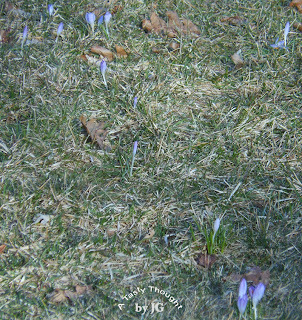 The first day of Spring may be tomorrow. I may be dreaming of the vibrant colorful abundant Zinnias (grown from last year's saved seeds) that will be blossoming in our gardens this summer. However, my DH is snow blowing our driveway! Say it cannot be... but it is a fact. Snow fell last night! 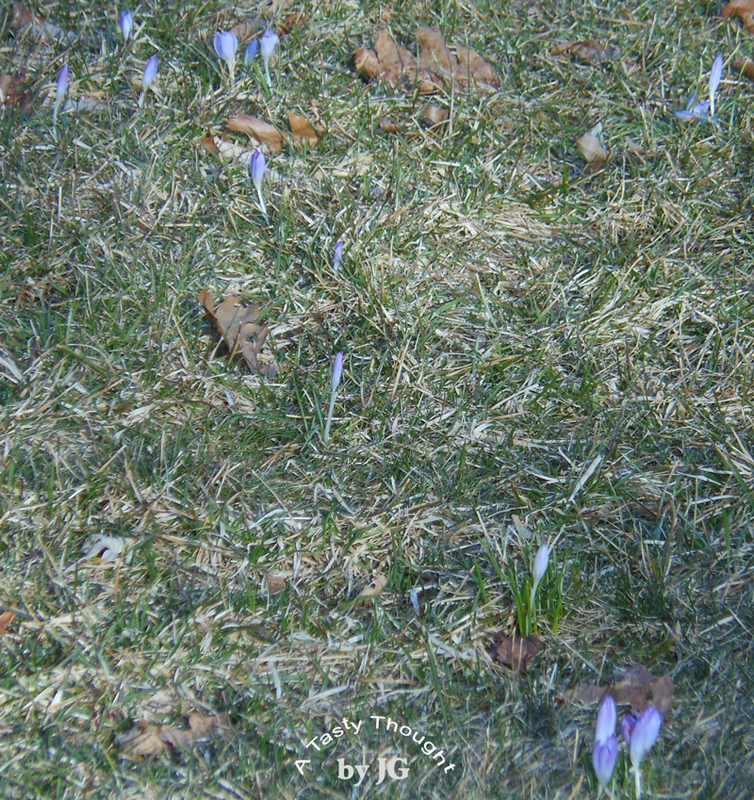 The hardy crocuses that are finding their home in our lawn are now totally covered with snowflakes. March 17 is approaching! This week an important item on my grocery list is Fat Free Buttermilk. Best to purchase another container of Raisins, also! On Saturday Irish Soda Bread will find its place in my oven. 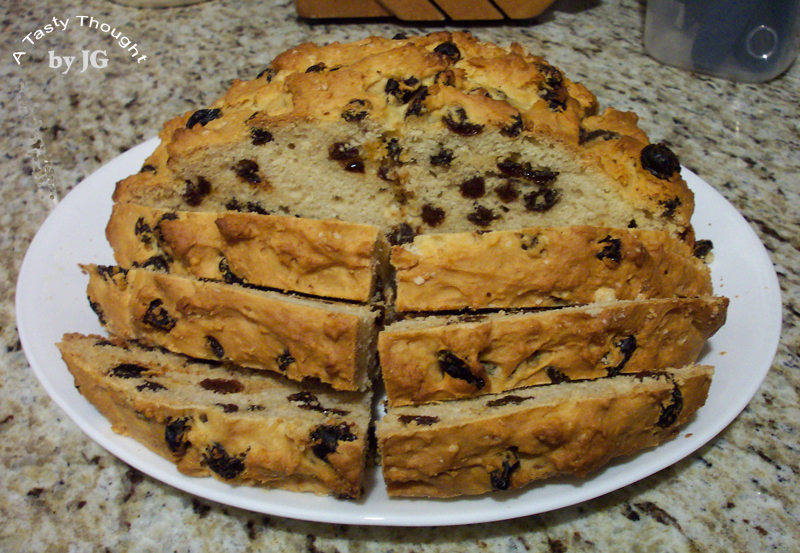 Every year as I prepare this moisty, delicious, raisin filled bread (also called Spotted Dog) for St. Patrick's Day, I recall when I googled and located the recipe. In my fridge was an opened half filled container of buttermilk. After searching and clicking online for an Irish Soda Bread recipe, I located a recipe that Carol (from Charli and Me) had shared. It was eggless, contained buttermilk and a large amount of raisins. Here is some background: The original recipe is from the Will O'Glenn Irish Bed and Breakfast in Michigan with Mrs. Biddy Gahan sharing it. 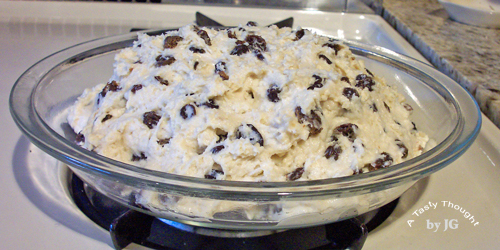 Then Carol very graciously shared it and I'm so pleased that I googled and discovered this raisin filled bread! Thanks to all who made it possible for me to discover it! It's delicious! One year with my oven working overtime, I melted the Butter in error. After it cooled, I added the melted/ cooled Butter to the dry ingredients and discovered that the dough was easier to work with. I have a gas oven and I learned that an extra 15 minutes baking time was needed. It is included in my recipe below. Lower oven to 375°F. Bake 30 Minutes longer. Remove the bread from pie plate and cool on rack. After cooled, wrap in plastic wrap and aluminum foil. I cut the bread into slices and then place in two sealed Ziploc Bags. A half slice of Irish Soda Bread is a very tasty treat. Extra slices do freeze well. It's very difficult to enjoy only one half slice after the cooled bread is sliced! So good! This month is all about green! St. Patrick's Day is approaching! 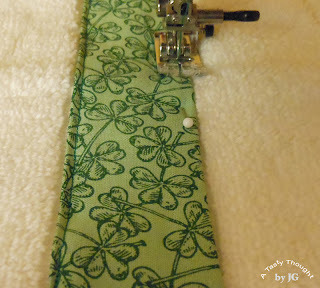 I glanced over to my fabric stash (that had been previously washed) and located the shamrock fabric. 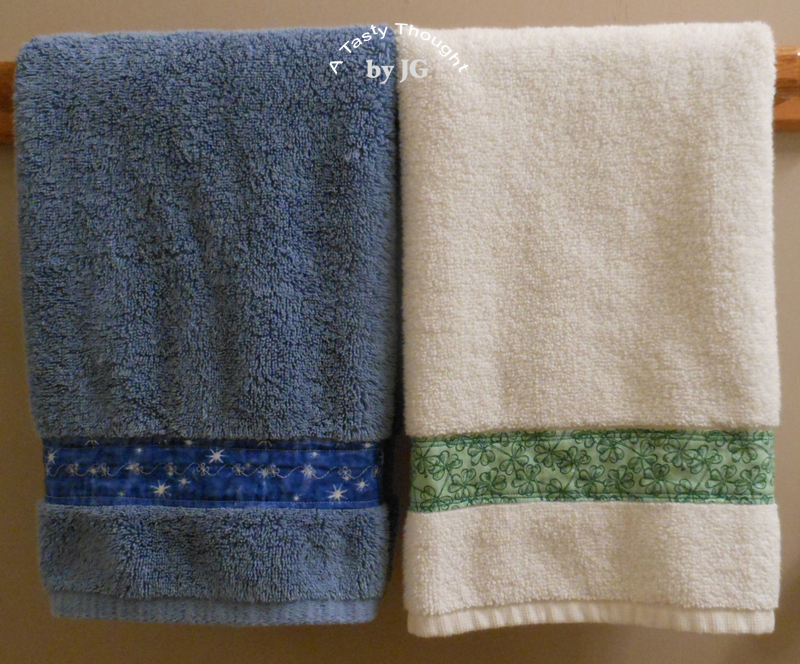 On another "project pile" a newly purchased (previously washed) hand towel was easily found. Now, that combination could only mean one thing...a new decorative guest towel for our bathroom was in the planning stages. Decorative Hand Towels look wonderful! I've purchased them in the past...only to be disappointed when the terry cloth or the decorations do not hold up well after washing. My solution has been simple! I enjoy sewing. 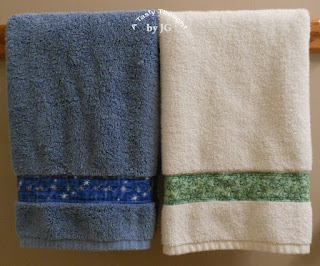 Why not make them for holidays and special occasions using better quality towels? Now, that's exactly what I do! A strip of fabric is cut to fit into the towel's recessed area near the bottom edge. The strip is 2" longer than the towel's width. That way I have an extra 1" on each side to play with when doing the finishing work and sewing. The height of the desired strip is measured and 1/2" more is added to the measurement, so both the top and the bottom edges may be turned in 1/4" and pressed. The raw edges on each side of the strip are also turned in, pressed and then turned in again and sewn in place. Sewing decorative strip in place. When sewing the strip in place: I like to wrap a very small portion of the colorful decorative strip around the backside of the towel when attaching, so I allow for an extra 1/2" on each side. Pin the strip onto the plain recessed portion of the towel's front and sew in place. Really easy! If you enjoy sewing, as I do, a quick trip to nearby Jo-Ann's works into a routine, quite often. Fabric that catches my eye is purchased to be used in the future. Usually 1 yard will be purchased using a 40% or 50% coupon. Amazing what can be made with 1 yard added to another yard. March brings whimsical thoughts! 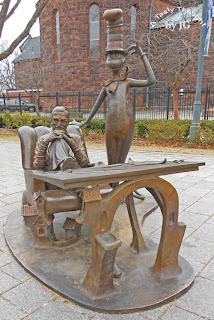 Thinking about Dr. Seuss writing his rhymes and also thoughts of leprechauns on March 17. 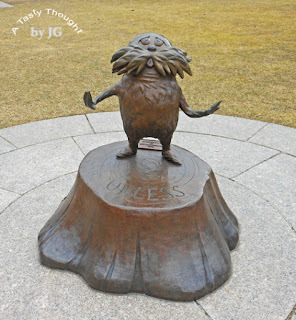 On Tuesday afternoon as I was leaving the grounds of the Springfield Museums, a young child ran through the snow to the Lorax who greets visitors as they enter/leave the museum complex. She gave him a hug! Now, that's a sweet compliment to Theodor Seuss Geisel. Her parents & I smiled as we watched. Ted as his friends called him was born on March 2, 1904. His birthday is celebrated every year at the Springfield Museums! Seuss was his mother's maiden name. Dr. Seuss' books written for children of all ages are fantastic! The people and the places in his stories are all part of Springfield's rich history. At this time of year we remember our fave story that he wrote. 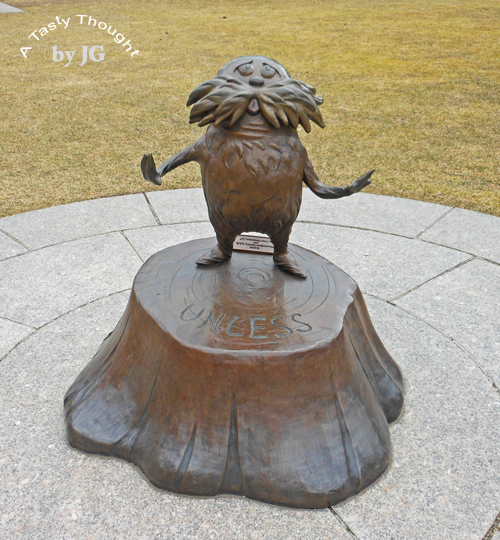 For more info about Theodor Seuss Geisel, click on this link. Last year I took photos of the bronze statues located in the Memorial Sculpture Garden at the museum complex. 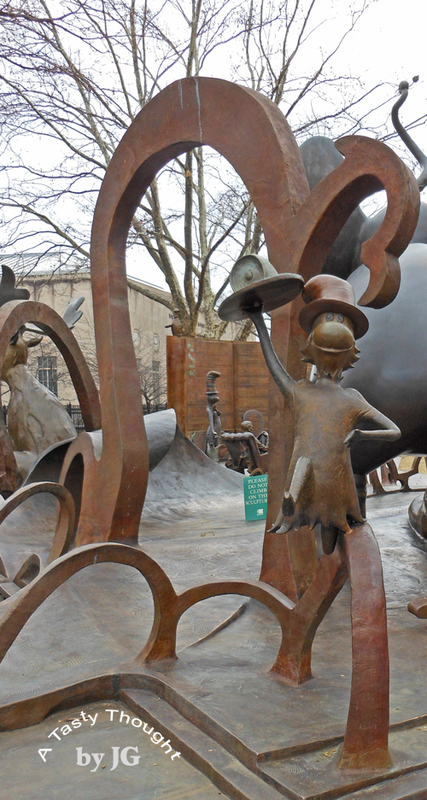 The beautiful statues were designed by Dr. Seuss' step-daughter, Lark Grey Dimond-Cates, who is a sculptor. I like many Dr. Seuss stories, but my all time fave is Green Eggs and Ham! What is your fave Dr. Seuss story?